In 2008 the ITTF introduced new rules and regulations for table tennis rackets. These included a requirement to only use VOC-free glue to affix rubbers. 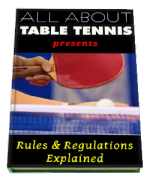 Whether you call them table tennis bats, table tennis rackets, table tennis paddles, ping pong bats, ping pong rackets or ping pong paddles ... you'll need to know about the new rules and regulations that the International Table Tennis Federation (ITTF) introduced in 2008 relating to your table tennis racket. By the way, although a racket is referred to as a paddle or a bat in some countries, the official Laws of Table Tennis call it a racket. You can read more about the basic racket rules here. In 2008 the International Table Tennis Federation (ITTF) introduced some new rules and regulations relating to the table tennis racket. This included a new system for testing rackets to ensure that they complied with all the new and existing rules and regulations. Since the 1980s, table tennis players have experimented with different types of table tennis glue to affix their rubbers to their table tennis bats. It was discovered that certain types of glue had the effect of increasing the speed of the table tennis rubber if the player re-glued the rubber at frequent intervals. This gave the attacking / offensive player a distinct advantage and gradually led to the development of "speed glue". However, this type of glue contained volatile compounds which gave off a distinctive odour. This odour is now considered harmful to a players' health. Therefore glues containing volatile compounds cannot be used, and testing for the presence of Volatile Organic Compounds (VOCs) is now carried out at ITTF events. Since 7 October 2009, a device called a Mini-RAE Lite®, which can detect very small amounts of solvents, has been used to test rackets. Boosters and tuners also contain VOCs ... so they're not allowed either. You're not allowed to change or modify your rubber's playing characteristics by using chemical or other treatments, nor change its friction, outlook, colour, structure, surface, etc. Your rubber must be used just as it's been authorised by the ITTF. If you want to clean your rubber, you should only use plain water. Rule 2.04 has always stated that a table tennis bat with sandwich rubber must have a total thickness, including adhesive, of not more than 4mm. However, umpires have never been able to accurately check this ... until now. A new thickness measurement device has now been developed and is being used to check the thickness of your table tennis rubbers. Regulation 3.02.01 was also amended to state that the ITTF logo and authorisation number, in addition to the supplier and brand names, must be clearly visible near the handle of the blade (so that they can be verified). Here's an example of the details you'll see on the lower portion of Butterfly Tenergy 05 rubbers. The new regulations mean that racket testing now takes place at events where the regulations are being used and the player is responsible for using a clean racket, i.e. without VOCs and with the correct rubber thickness. So it's important that you don't add anything to your racket. However, all players are entitled to have their rackets tested voluntarily, without any penalties, before the match. Rackets that don't pass the racket control test before the match cannot be used but they can be replaced by a second racket - which which may be tested immediately if time permits, but if not, will be tested after the match. Where rackets do not pass a racket control test after the match, the offending player will be liable to penalties. 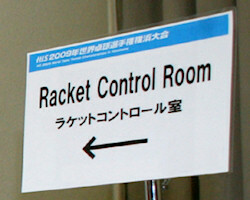 In addition, this new regulation states that the ITTF will maintain a register of all racket control failures. So, what does this all mean for players? Air your new rubber outside the plastic bag for at least 72 hours before gluing it to your table tennis bat. Only use water based glue or VOC-free, pressure-sensitive, adhesive sheets. Only clean your table tennis bat with water - don't use any other substances. Adding natural substances such as oils, etc. is illegal and will be detected. Do not stretch your rubber. You must use the rubber as it's been approved by the ITTF and as it comes from the producer. You should use a thin layer of glue to avoid exceeding the 4mm thickness limit. Make sure the surface is flat and does not bulge. Sometimes the rubber is too thick when it comes from the factory. It's your responsibility not to use it. Always carry a spare table tennis bat if you can. The ITTF intends to impose the strictest penalties on those that break the rules. This includes players, coaches, National Associations and manufacturers. So, take care of your table tennis bat and don't break the rules - you have been warned!